IPT was present in the fourth Feiplar Composites & Feipur – international business exhibition and conference related to the application of composite materials, polyurethane and plastics – which is a biannual event based in the city of São Paulo, Brazil. The Institute stand received many visitors during the period of three days of the event, mostly because of the real-scale demonstrator of an aircraft fuselage, manufactured with carbon-fiber-reinforced-polymer (CFRP) skin and stringers. The project started around four years ago, when the laboratory infrastructure began to be built. The last two years were dedicated to the design, development and manufacture of the demonstrator exhibited, under the coordination of the Lightweight Structures Laboratory. The project also involved a team of engineers and technicians from Embraer, and was supported by Empresa Brasileira de Pesquisa e Inovação Industrial (Embrapii). Among other factors, the project must allow the Brazilian aeronautical industry, in the near term, to design more complex parts for aircraft applications, as well as the reduction of fuel consumption due to lighter structures. “Our main objective to be present in the exhibition was to show that we can develop components as big as required by the costumer for real applications. This capacity is due to the knowledge and equipment hold by our Institute, and projects are especially attractive to companies when it is possible to use funding from Embrapii, which are restricted to technology readiness levels 6 or below”, says the researcher from the Fundação de Apoio ao IPT (FIPT), Rodrigo Andrade, who was the project leader. “This project is considered a pilot initiative for the laboratory, and we would like to have more innovative projects, also funded by Embrapii, with the aerospace sector, as well as other relevant industrial sectors such as the oil & gas, automotive and wind-turbine blades”, explains Andrade. 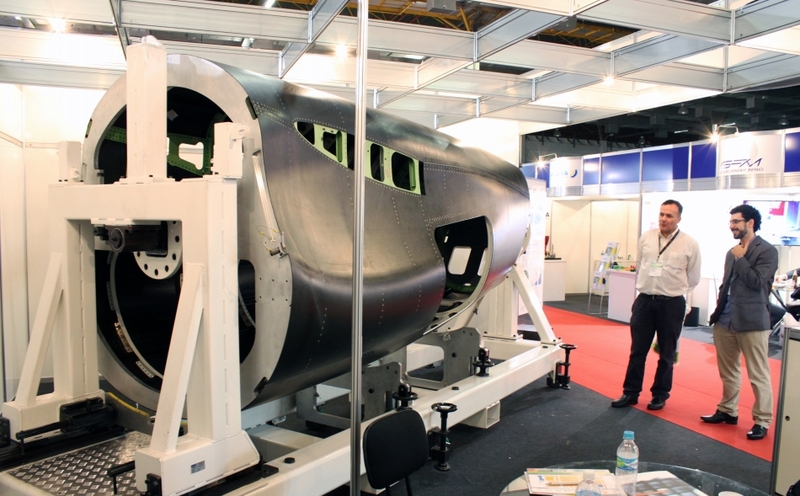 The demonstrator occupied most of the stand space, and it represents the rear fuselage of a small civil jet. The component, considering the assembly jig, measures close to five meters long and 2,5 meters of height. The visitors could see the interior of the fuselage through a cutout due to a baggage loading door. “It is an important result for the aerospace industry, which needs to be constantly looking for new ways of manufacturing structures”, praised Ji Ling Xu, from the Chinese Taishan Group, who was present at the exhibition. Jayme Wittgenstein, from the USA, mentioned that the use of CFRP parts is also important to reduce carbon emissions. “Beyond mechanical innovation, it is also a sustainable innovation”, says him. According to Andrade, the main advantage of CFRP structures is the capability to achieve lower weights. The use of metals, such as aluminum and titanium alloys, is still very common on aeronautical structures, especially in single-aisle aircraft. “The use of CFRP components allow for mechanical properties equal or superior to the ones which are based on metals, but they are lighter”, explains Rodrigo. The bigger manufacturers of aircraft, such as Boeing and Airbus, already use extensively CFRP in their structures, especially in the Boeing 787 and the Airbus A350. Embraer already manufacture some parts in CFRP and now it is ready to increase even more the use of composites.